How We Protectyou & Your Family with Our 3 Guarantees! i have an animalinside my homewhat should i do now? How are you goingto get rid of my pestand what is the process? C.H.A.O.S. stands for “Capture Harassing Animals On Site” which encompasses the services offered by our company. We are a full service wildlife and pest management company located in Westchester County, New York. We specialize in the trapping and removal of nuisance wildlife and pests as well as the prevention, control and repair of damages to residential and commercial properties caused by animals. We’re committed to being the best custom wildlife controllers in Westchester. We assure our customers the highest quality services and a complete turnkey solution for your needs. Our guarantee to you is that your wildlife will be removed safely and properly from your home. 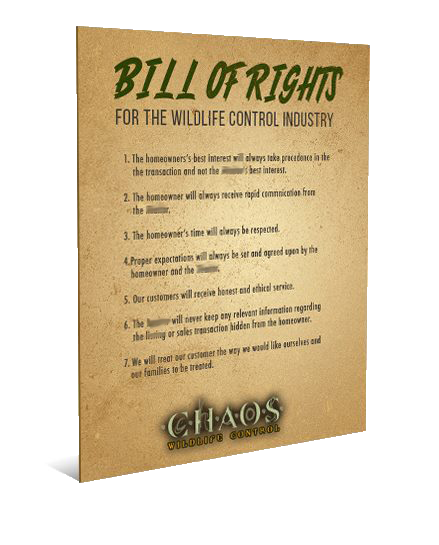 We are the only Wildlife Company offering these 3 unique guarantees to ensure your safety (Click to Learn More). First we ensure that you and your family is secure and safe. Our primary objective is to secure interior quarters and living space to ensure that your family is safe. Then, we inspect the premises to identify where the animal or animals are, how they got in, and how we are going to get them out of your home. There is a fee for the inspection, if given the green light to remove the animal off the premises, your fee will be deducted from the total of the job. What Animal Is In Your Home?